As it often happens with my book reviews for the blog there is an element of chance and surprise involved when discovering a great book for review. 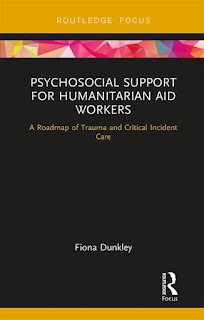 Fiona Dunkley’s Psychosocial Support for Humanitarian Aid Workers: A Roadmap of Trauma and Critical Incident Care is no exception-it probably popped up in my Twitter feed or in a post in the 50 Shades of Aid Facebook group. In light of the #AidToo developments and longer-term discussion in the industry about staff care, well-being and psychological support this is obviously an important and timely book. This book has taken you on a journey of understanding trauma, highlighting the psychological risk to aid workers, explaining the physiology of trauma, sharing in-depth case studies to explore therapeutic trauma models, exploring coping strategies, managing critical incidents, highlighting pathways to care throughout deployments, and discussing the cultural relevance of trauma psychosocial services (p.115). As a researcher and teacher I am always a bit skeptical when authors or endorsements promise a book with relevance ‘for everybody in the industry’, but Psychological Support delivers on that front: There are parts written with a self-help framework in mind, but most importantly, as the subtitle suggest, it is a self-mapping book. It provides a roadmap for individuals about how to prevent trauma or get help and at the same time provides a professional framework for those who provide or manage care, have humanitarian aid worker family and friends or have a research or pedagogical interest in models around such support. Dunkley’s vignettes, based on extensive work in- and outside the humanitarian industry, are powerful, tough stories and the theoretical framework around psychology and cognitive science helps the reader not to feel overwhelmed while at the same time being reminded compassionately that psychosocial support is not a simple ‘toolbox’ or ‘guideline’ that should be buried inside your computer. Years of traveling, often at short notice, to dangerous places: the unforgettable smell of a mass grave in a Lebanese summer; constantly juggling social and work life; hearing the crack of a bullet overhead in Yemen; talking about risk across grand tables in HQ, or plastic tables in the field; a close call in Syria, and guilt-inducing missed calls on my ever-present work phone had all taken its toll (p.3). Dunkley remembers the Grenfell fire in London and how she ‘watched in horror as many therapists, who were not trauma specialists, volunteered and carried out assessments un-vetted’ (p.5)-a reminder that, as always, good intentions are not enough and real professionals should be hired to do professional jobs. Journalists, therapists, aid workers, medical staff, social workers and care workers can all be exposed to vicarious trauma. Likewise, office staff can be exposed vicariously to trauma. This was highlighted in the Ebola response. Aid workers that were exposed to stories remotely started to experience trauma symptoms and requested psychological support (p.14). I find working with trauma inspiring, not only because of witnessing the human spirit to survive, but also because of the privilege to travel such difficult terrain with an individual who is suffering to a path of greater resilience, self-compassion and traumatic growth (p.23). There is such a lot of useful, practical material in the book, but one final aspects I would like to highlight is the chapter on Cultural relevance of psychosocial support. By not checking with those with whom we are working, we risk causing harm through our assumptions, by being misguided or blinkered, such as offering individual therapy rather than engaging a family, community or organisation; or by offering assistance through an inappropriate channel, such as a mixed-gender group (pp.99-100). As I wrote in a recent post about some trends in aid industry employment, looking after those who provide aid is going to be an area of growth that deserves highest professional standards. Returning to where my review started, Psychological Support for Humanitarian Aid Workers is an excellent resource that creates an important road map from knowing about trauma, building resilience, managing emergencies and creating a comprehensive ‘grab bag’ in a professional, culturally appropriate way. The core principles of humanity, neutrality, impartiality and independence are more necessary than ever. (…) I strongly believe healing communities and countries suffering from trauma will lead to a more cohesive, inclusive and peaceful world (p.111). One of the biggest challenges is the book’s accessibility-the printed hardback version is quite expensive (although within reason for a commercial academic publisher) and the Ebook version, although cheaper, may not be ideal for all environments of the global aid industry-I would really hope that an organization or donor comes forward and supports an open access version of the book-a few thousand pounds very well spend on making this world a safer place! 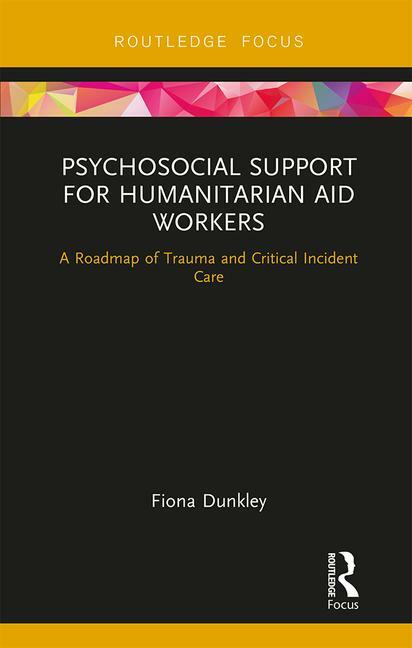 Dunkley, Fiona: Psychosocial Support for Humanitarian Aid Workers: A Roadmap of Trauma and Critical Incident Care. ISBN 978-1-31520-145-0, 136pp, 13.50 GBP (Ebook version), Boca Raton, FL: CRC Press/Routledge, 2018.